Well, the doughboy train has left the building...and I'm not on it. The Pillsbury Bake-Off is the highest pursed cooking competition in the country. With a $1,000,000 prize, it gets entry after entry after entry every year. This year they decided to add the "voting" element, which REALLY deterred me, but I figured I'd send them a few anyway and try my luck. 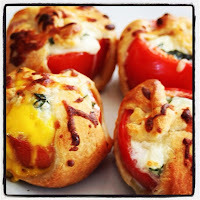 I'm not a big crescent roll person, but this recipe was REALLY yummy and EASY. I love anything with tomato and basil, and of course, breakfast is the BEST meal of the day!